Obituary – Lambert, Sharyn Kaye (Roberts) « Perry High School Alumni Association, Inc.
﻿Band 50-54; Junior Play 52-53; Glee Club 51-52. Sharyn Kaye Lambert, 66, of Kingfisher died Sunday, Jan. 26, 2003, at Integris Baptist Medical Center in Oklahoma City, OK.
Mass of Christian Burial will be held at 10 a.m. Wednesday, Jan. 29, 2003, at Sts. Peter and Paul Catholic Church in Kingfisher with Rev. Price Oswalt and Rev. Edward Weisenburger officiating. Burial will follow at Holy Trinity Cemetery, under direction of Sanders Funerals Service. She was born June 11, 1936, in Perry, OK., to Worth and Agnes Roberts. 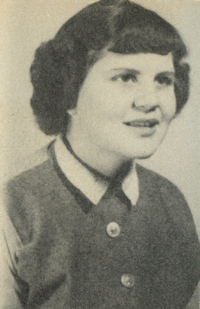 She graduated from Perry High School in 1954 and received her diploma in nursing from Mercy School of Nursing in 1957. She married James Lambert on Aug. 15, 1957.
hospitals. She retired from nursing as the director of Second Shamrock Nursing Home in 1992. She was a member of Sts. Peter and Paul Catholic Church. Survivors include her husband, Mr. James Lambert of the home; one son, Mr. James Worth Lambert of Kingfisher; one daughter, Mrs. Bonnye Mueggenborg of Okarche; one sister, Vaynne Cowell of Stillwater; four grandchildren, Kirstin, Beau, Sarah and William Mueggenborg, and two step-grandchildren, Ethan Snow and Jared Snow. She was preceded in death by her parents, one daughter, two sisters, and two brothers. Memorials may be made to Oklahoma Medical Research Foundation for liver research.